Hello! 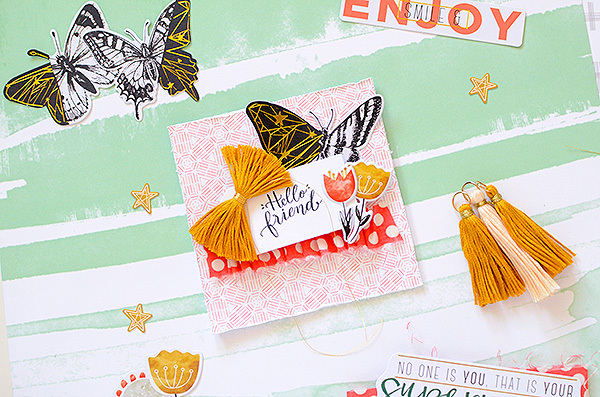 If you've come from Isha's blog as part of the Pinkfresh Studio DT Intro Blog Hop, welcome! I've seen all the girls' sneak peeks so I know you've seen some awesome projects already! I'll have the full hop list at the end of this post for you. This is a great chance to meet the entire Pinkfresh Design Team--there are lots of new faces for this term, and some familiar ones, too. At the end of the post you can also leave me a comment to win an awesome prize pack of new Pinkfresh products! 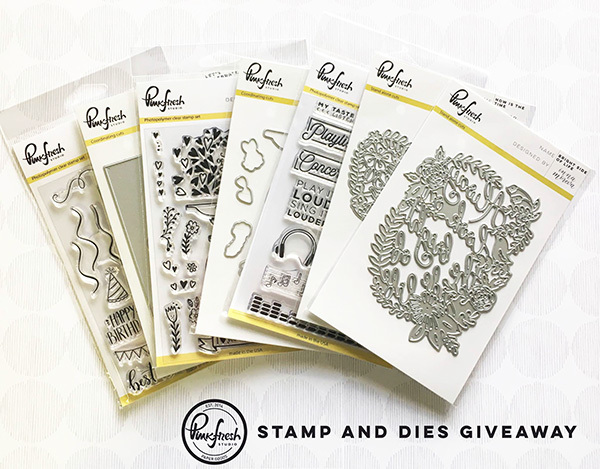 You'll have a chance to win a stamp & die prize pack worth $100 OR the entire Escape the Ordinary paper/embellishment collection. The two winners will be randomly selected. To be eligible, you must leave a comment on ALL blogs in the hop. Comments close at 11:59 PM CST on Friday, August 18th. Winner will be announced on August 25th on the Pinkfresh Studio blog. 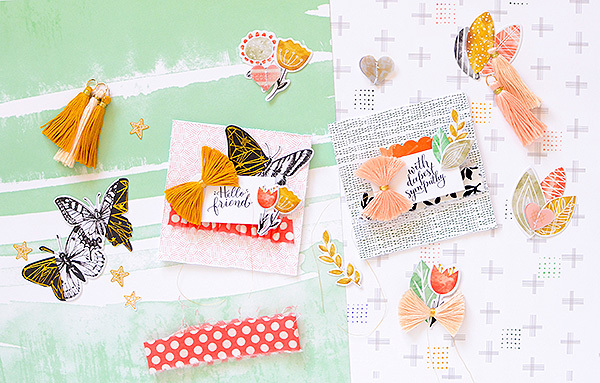 I'm sharing 2 cards, using a mix of elements from Escape the Ordinary and stamps. I wanted to use some sentiment stamps in conjunction with the colorful elements of ETO. My first card is an all occasion greeting against a piece of graphic coral paper from the 6x6 paper pad. 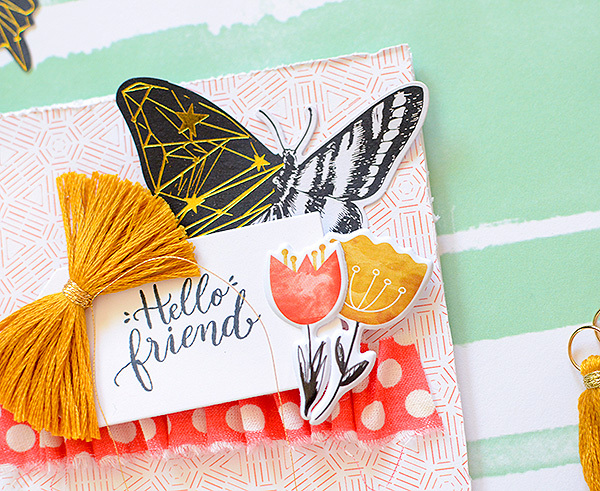 The butterfly die cut, with its gold foiled details looms large behind the stamped tag and floral puffy stickers. I added some dotty fabric and a marigold fringe bow from my own stash to match the florals. 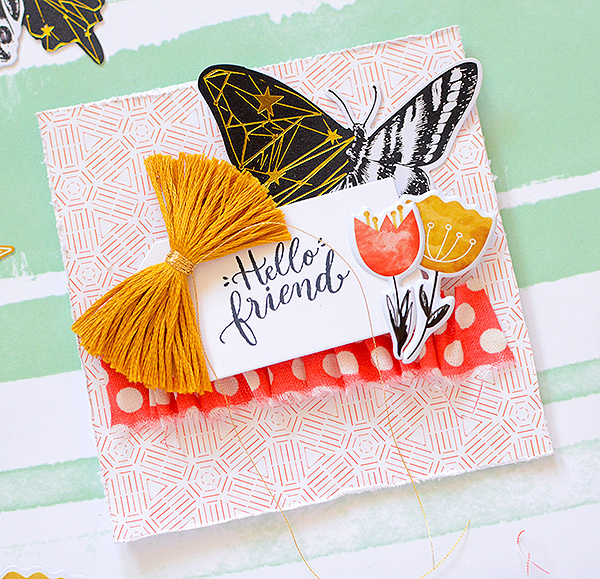 The 'Hello friend' stamped sentiment is simply stated and beautifully lettered by Inna Moreva. You can find the stamp on the 'Forest Friends' set. My second card follows the same sketch, but is not quite as bright and bold, due to the fact that it's a sympathy card. I'm sure I'm not alone when I say that these are my least favorite cards to make, due to the sad subject matter. However, I also think that they are some of the most important and meaningful--and appreciated. Thanks for stopping by and be sure to visit Anna next! Don't forget to leave a comment everywhere you go for the chance to win some awesome Pinkfresh Studio goodies! Oh these are divine cards! Love them all! Beautiful projects! So creative. I'm loving this collection. So many pretty goodies. Thanks for sharing! Colors are so vibrant. Thank you for sharing. 6X6 pattern papers are my weakness and I like what I see here! Refreshing designs on your cards! I love the variety of materials you used, including the sweet little bows. Love your bright colors and design layering, So interesting! great use of die cuts. Wow, these are so beautiful and unique. I love the small pieces of fabric you used to bring both cards a soft touch. Very well done. Beautiful! 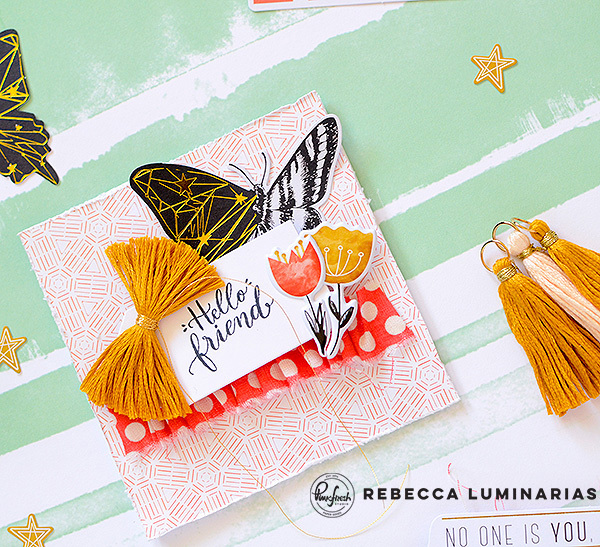 Love the tassels and the cute little butterflies! Beautiful cards and I love the tassels too! Love all the layers. Pretty card designs. I like the colors and embellishments. Absolutely beautiful Rebecca! Love your work! I so love your style!!! These are beautiful! I love the gorgeous colors in your work! 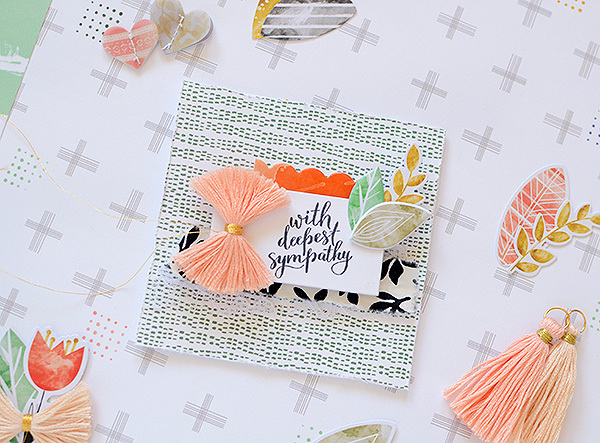 The bright orangey pinks, the colorful tassels--it all blends together so beautifully! Your cards are lovely and really showcase the product. Thanks for the inspiration! That is a beautifl sympathy card and I hopw the crafter who recieves it is comforted during the difficult time of a lost family member. I always wondered if cards by bloggers were made and sent out or just made for show. Now I know. Thanks for sharing great idea with the tassle bow! To keep it in place did you glue the back or you left it fluffy frilly? Love the tassel! Beautiful cards. Very interesting and unique creation ! I love the range of textures and materials in these cards. Thanks for all the inspiration! The butterfly idea is amazing, great use for the tassels! Wow, beautiful cards! Your layering and color scheme make them look so fresh and modern! Not really being a peachy person, I have to say - I may reconsider! Nice cards. Gorgeous! Love how you combined the colors. Beautiful. I love all the texture and layers. Absolutely lovely and elegant wrapping.. I love your gifts. I wish if I can receive a gifted wrapped like this..
Rebecca thank you for sharing. The collection is gorgeous!! Beautiful cards especially the sympathy one. Oh I love the two pattern butterflies and the fringe bow! I love this collection. Can't wait to work with it! Thanks for sharing. My favorite is the two toned butterfly! A very warm welcome to the Pinkfresh Studio's new Design Team!!! Both your cards are simply gorgeous!! Beautiful cards! Love the layers and textures! Gorgeous details and colors! Love these beautiful cards and the added textures! Lovely! Exciting news about the new DT... congrats! Your cards are so bright and fresh! Beautifully done and great use of the elements in the collection! I really like the "Hello, Friend" stamp! The lettering is so pretty! Your "mixed media" approach is lovely. Fresh ideas instead of the same ole',inside the box coloring of cards. Thank you. Your card is so lovely! 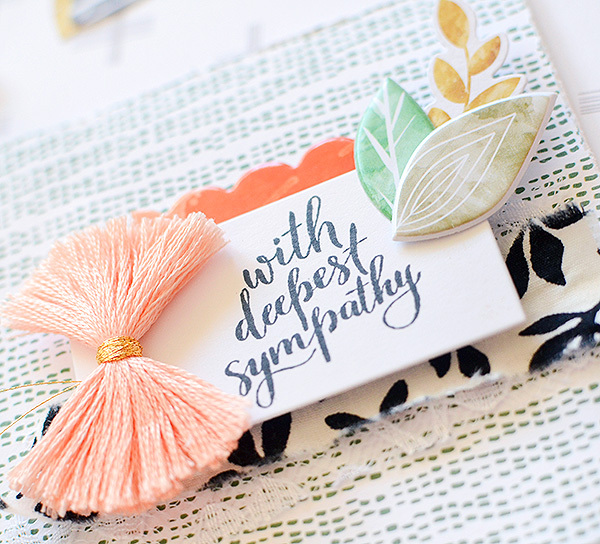 I was hesitate to use very many embellishments on a sympathy card, but you've made it look so easy. Pure eye candy! thanks for sharing! Wonderful cards, love your fun designs. Gorgeous cards! I love the added texture of the fabric and the bows. Did you make the bows from the tassels? They are BEAUTIFUL! Love the fresh ideas on your cards. The tassel bow is an amazing concept. Thanks for sharing your genius with us. Beautiful cards I love all the details esp the tassel bows! 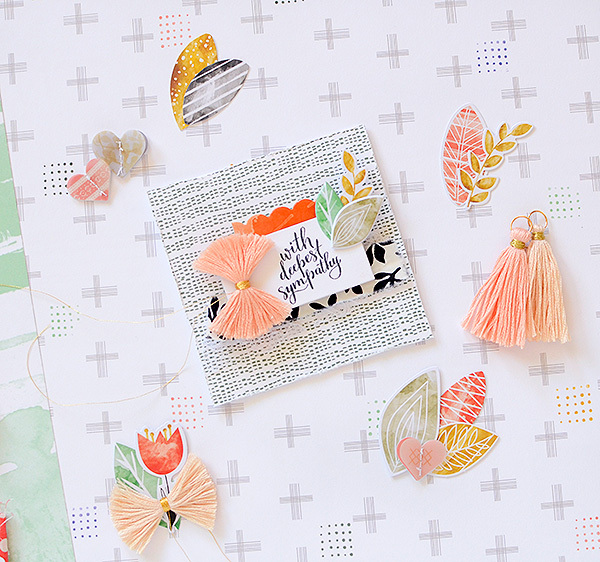 I love the combination of papers and the tassels! Those sentiment stamps are really lovely. Love these cards and the mix of soft, texture and the black and white pop. Lovely cards. I really like all the different elements used. Oh wow wow wow, so beautiful!!!! Two beautiful cards! 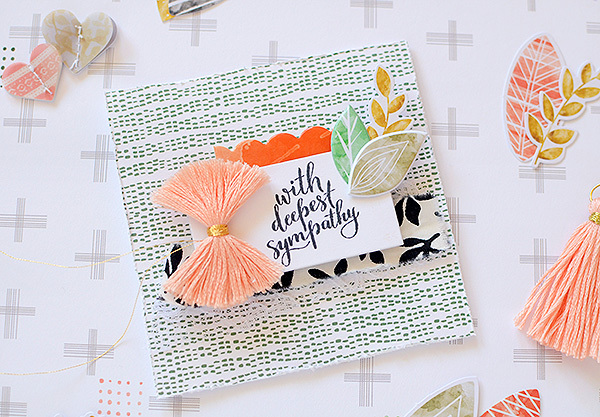 You've really shown us how one card design can be used on totally different ways. thanks for sharing! These cards are just beautiful. Love this new collection. These colors are just so fresh. Love them. 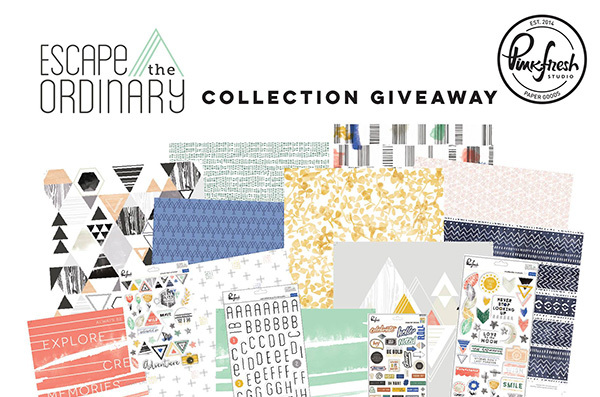 Beautiful cards, great blog hop, awesome collection! Your cards are always a must-do! So so beautiful, Rebecca. in this card. Your second card also awesome!!! This colorful original card photos are not the same as how we see in online or any kinds of print media. There is a huge or small photo retouch or edit need in every images. For this why, ecommerce stor or photographers hired Retouch Expert. in this card. Your second card also awesome!! !